After the poor 1974 season, Formula 3 was completely revived in 1975, not just in Britain but in Italy, Sweden and Germany. The British series, sponsored by BP and organised by the BARC, was the most important of these as it was the only one open to drivers of all nationalities and was regarded by some as the effective European championship. There was also a European Cup, but in this first season it was barely noticed. The BP championship dominated by three works operations: March, with drivers Gunnar Nilsson and Alex Ribeiro, Modus, with Danny Sullivan, and Safir, with Patrick Neve. The works GRD operation also mounted a comeback but it was a failure, despite a surprise GRD win at Monaco, and the company collapsed the following year. Nilsson was a worthy champion, winning five British championship events plus three others, including the opening round of the Swedish series in April. The series continued to be a stepping stone to F1 with Nilsson, following a very successful late-season cameo in Formula Atlantic, securing a drive at Lotus for 1976. The March 753 was the dominant car with 32 podium finishes, followed by the Modus M1 with 10, the Safir with six and the new Ralt RT1 with five. Old GRDs and Brabhams shared the other four. 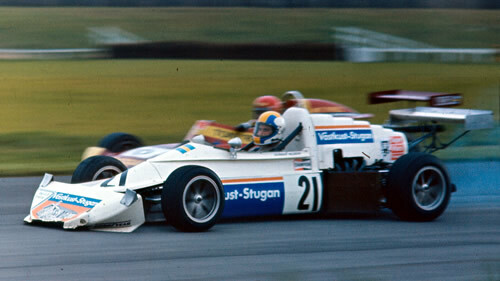 The March 753 looked much like the previous year's F2 742 while the Modus was a development of the 1974 car. Ray Jessop's Safir was a one-off so, apart from a handful of GRD 375s, the only other production F3 car in 1975 was Ron Tauranac's new Ralt RT1. This series ran over 19 rounds and used a 9-6-4-3-2-1 points system with an extra point awarded for fastest lap. Points tables from Autocourse 1975/76 p200. Three rounds of the new European Cup also counted towards the British championship and these were won by Renzo Zorzi (Scuderia Mirabella Mille Miglia GRD 374-Lancia/Repetto), Conny Andersson (Rotel Racing Team March 753-Toyota/Novamotor) at Anderstorp and Perkins at Monza. The three non-championship races covered here were won by Ribeiro, Perkins and Nilsson; Nilsson also won a minor race at Aintree in April. The most successful engine of 1975 was Novamotor's Toyota twin-cam powerplant, maintained in the UK by John Penistan. At £2,900, it was nearly twice the price of Neil Brown's Ford twin-cam engines and a lot heavier but had a wider power range and won 11 of the 19 championship races. Seven of the other eight were won by Ford twin-cams with Novamotor's version proving the most successful ahead of the Neil Brown and Holbay versions. The other race, the Monaco GP F3 race, was won by a Lancia Beta Montecarlo twin-cam engine derived from the Fiat 124 powerplant and built by Giuseppe Repetto of Repetto Motors. Other engines to be seen included the BMW 2002 or M10 engine, built by Josef Schnitzer, Max Heidegger and Peter Schrick; the troublesome Ford ohc Pinto engine developed by Holbay; and, right at the end of the season, a new Triumph Dolomite Sprint engine built by Neil Brown. The 1975 results have been compiled by Chris Townsend using the main British magazines Autosport and Motoring News, and Autosprint in Italy. The BARC Archive has also been immensely helpful and as a result, the only programme needed is for the Knockhill race on 3 Aug 1975. The top six or top ten finishers are generally known but full results are still needed for many of the races. Qualifying results are largely complete but copies of practice or grid sheets would be greatly appreciated. March and Ralt chassis records allow a lot of the cars of this period to be identified and it was common for Autosport, Motoring News and Autosprint race reports to mention former owners of second-hand cars. Autosport adverts as well as its 'Pit & Paddock' and 'Sports Extra' sections add further information on car movements. Modus and GRD records may exist somewhere and a copy, even a partial one, would help considerably.